Sound waves enter the outer ear and travel through a narrow passageway called the ear canal, which leads to the eardrum. The eardrum vibrates from the incoming sound waves and sends these vibrations to three tiny bones in the middle ear. These bones are called the malleus, incus, and stapes. 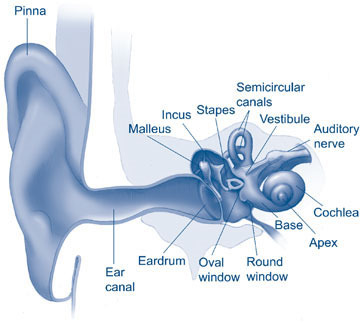 The bones in the middle ear amplify, or increase, the sound vibrations and send them to the inner ear, also called the cochlea, which is shaped like a snail and filled with fluid. An elastic membrane runs from the beginning to the end of the cochlea, splitting it into an upper and lower part. This membrane is called the “basilar” membrane because it serves as the base, or ground floor, on which key hearing structures sit. The auditory nerve carries this electrical signal to the brain, which translates it into a “sound” that we recognize and understand. Hair cells near the base of the cochlea detect higher-pitched sounds, such as a cell phone ringing. Those nearer the apex, or centermost point, detect lower-pitched sounds, such as that of a dog barking. Our two ears act like radar antennae to register acoustic signals coming from multiple directions. The complex structures of each ear process the received signals and pass them to the brain, where we interpret our acoustic environment. Take, for example, the sound of the wind or of an approaching truck. The nearest ear receives the sound slightly earlier than the other, and slightly louder. Using the finely processed acoustic information from each ear, the brain has the capacity to calculate the direction of the wind or the direction of the truck’s approach. The advantages of having two properly functioning ears include: excellent sound localization skills; a better understanding of speech in noisy environments; rich sound quality; accurate judgment of appropriate volume, and the ability to hear all tones of voice, including those of small children. Sensorineural hearing loss is the most common type. It is caused by damage to the inner ear and/or the auditory nerve. Noise exposure, diseases, certain medications, and aging can destroy parts of the inner ear and cause permanent hearing loss. Sensorineural hearing loss usually affects the high frequencies, which impairs a person’s ability to differentiate consonant sounds, and thus, the fine distinctions in words such as “fit” versus “sit.” Your audiologist can effectively treat this type of loss with hearing instruments. Conductive hearing loss is generally caused by a problem in the middle or outer ear. It may also occur from a defect in the ossicular chain. Conductive hearing loss can often be medically treated. Your audiologist will be able to diagnose this type of hearing loss and refer you to the appropriate medical professional for treatment. When a patient has both a conductive hearing loss and a sensorineural hearing loss, it is called “mixed hearing loss.” This type of hearing loss often requires both medical and surgical interventions and the use of hearing aids. Your audiologist will diagnose this type of loss and refer you to the appropriate medical professional for treatment. For more information about hearing loss or to schedule a hearing test, contact us today. We have locations in Chesterfield and Clayton, MO. Ringing, buzzing, or hissing in the ears can be a sign of hearing loss that needs treatment. Whether it’s continuous or intermittent, this ringing is called tinnitus. Sometimes, the ringing is caused by blockage or an infection that can be removed. More often, tinnitus is associated with damage caused by loud noises. Many patients will try to ignore the phantom sounds until it becomes impossible to concentrate or sleep. Some hearing aids have the ability to cancel out or overpower the ringing of tinnitus. In rare cases, tinnitus can appear as a result of anemia, allergies, high blood pressure, neck injuries, diabetes, and other medical conditions. Q: What if I have hearing loss? If hearing loss is not caused by a medical problem, a hearing instrument, along with aural rehabilitation, counseling and speech reading may be necessary. Q: Does my hearing loss progress? While there is no way to know if an individual’s hearing will continue to deteriorate, the effects of auditory deprivation can worsen over time. When sound is not stimulating the brain, the potential to “forget” how to hear is great, and is closely related to the length of time the brain goes without stimulation. Usually the longer the patient goes without treatment, the more likely it is that the brain will forget how to hear and understand speech even after treatment is implemented. These findings suggest that it is important to seek treatment for hearing loss in a timely manner to receive optimal results.